Once you've added all the email addresses you use regularly, just signing into your main Hotmail account lets you check all your accounts, and even send messages from those accounts without having to leave Outlook.com! Note that you can add any email account you want (Gmail, AOL Mail, Yahoo Mail, etc.) - it doesn't have to be another Microsoft email address, in other words: as long as the target webmail provider supports POP3 -they nearly all do- it will work fine! This tutorial will show you how to setup a new send-from email account. The send-from account you pick determines which email address is used to send the message - not to be confused with changing reply-to address, which disregards which email account was used to send the message! Caution: to avoid uselessly hosting inactive email accounts,  most free webmail providers will automatically disconnect addresses that have not been used in a while (typically, between 3 and 6 months of inactivity). So make sure that you regularly login to your other email accounts, just to show that they are still active! (Sending emails through it doesn't count as activity.) The best way is to sign in to each account once a month: it's easy to remember and fit into your schedule. After an email address is deactivated for lack of activity, it will become available for new user sign up's. 1 Login and go to your Hotmail / Outlook.com inbox. 2 Click on the gear icon in the top right corner, and choose "Options". 3 Click Your email accounts in the next screen. 4 Click on the "Add a send-only account" button. 5 Enter your other email address and password. 6 Optionally use your SMTP settings instead. 7 Click Next, and follow the prompts. Tip: clicking on the Details link next to each email account lets you "update your SMTP settings". In email parlance, SMTP is the protocol used to send messages (as opposed to receiving). When you add another email account to Hotmail, it will send those messages " on behalf of " your alternate email address unless you provide the SMTP credentials that allow Outlook.com to actually connect to your other email account as if it were a desktop email client! Recipients may get confused when you email them with what appears like two versions of the same address (your Hotmail address, and the "on behalf of" version). The email address to which one replies is often automatically added to the contacts list / address book. If you typed the same, or a similar "From" display name, your recipients may accidentally pick the wrong email address when they start typing your name and the email program / webmail provider suggests a "To" recipient. 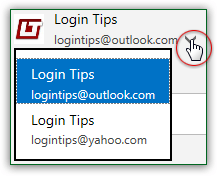 Emails you send that way will be in your Outlook.com sent folder, but never in that other email account's sent folder (depending on your provider, that may not make a difference). If you click on the "Advanced options" link, you'll be able to manually configure the server settings for the alternate send-from account. In most cases, you don't need to use that approach, because Microsoft maintains a database of popular mail providers to be able to automatically configure all those SMTP settings, behind-the-scenes: mail server address, outgoing port, SSL / TLS required or not, etc. Note that the username is typically your full email address. The " Outgoing (SMTP) server information " form is shown on the screenshot. Note: an "Outlook.com alias", though mentioned on that same Options page, is different. It allows you to create a new Hotmail account that is used inside your main account, particularly useful when you want to contact people or organizations without actually disclosing your real email address. Think of it like a temporary, anonymous email address of sorts. Even if you subscribe to the Ad-free Outlook.com service, your unused aliases will expire after three to four months of inactivity.